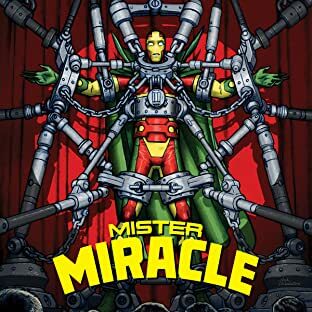 I fell in love with Mister Miracle (Scott Free), his wife Big Barda, and his partner Oberon in 1987 when they first appeared in Justice League and then also when Steve Rude drew his one-shot special. He appealed to all of my sensibilities as a ten-year-old. I mean, he was a super hero, so that was most important. But he was also a super escape artist! Awesome! Married? That’s cool! From another planet? What!? Traded as part of a peace treaty to Apokolips and raised in torture even though he’s the son of the Highfather, which is pretty much the equivalent to a supreme god? The stuff was amazing. Of course, back then, I didn’t realize this was all the brainchild of Jack Kirby. Had I known that, my astonishment would not have been so unexpected. Tom King has been on fire lately with Batman, which has not gone unnoticed by me. I’ve read those available collected editions, and while they are very good, I didn’t really understand why people were so ecstatic about his writing. Furthermore, if we’re being totally honest, I’ve never head of Mitch Gerads, the artist. Plainly stated — this may very well be the best first issue I’ve ever read (keep in mind I’ve been reading comics for thirty-seven years). Mitch Gerads won me over utterly and completely with the very first page. This first page simply shows Scott Free’s face, but his expression is so real, so, well, expressive, that it haunted me. I also noticed right away the dot matrix coloring, something totally unnecessary but absolutely charming. When you consider that Gerads drew, inked, and colored the art in this book … that’s quite a feat, especially because he did all three exquisitely. Almost all of the pages in this issue are nine-panel grids. That is a rarity in today’s comic book, yet it’s so brilliantly effective. It keeps the eyes moving, it keeps the pace going, it conveys both more story and action, and it’s just more fun. I love that the creative team took a chance on doing something considered passe and making it fresh. By the way, that expression on the first page? That’s nothing compared to what Gerads does later in the book. This is the most real Scott Free has ever felt. At times I could swear I saw a soul behind his eyes. Let’s talk about Tom King. By the second page, King displays his fearlessness by depicting Scott Free in need of a greater miracle than ever before. King presents a very serious conflict from the onset, one that he treats both respectfully and effectively. However, as you might expect, things are not necessarily what they seem. King offers just enough clues to lay the foundation of quite a mystery, one that makes both Scott Free and the reader question everything unfolding throughout the book. I love the constraint King displays in this first issue. By utilizing the nine-panel grid, he is able to convey a lot of story without hardly any words at all. As a result, he can keep the dialogue to a minimum. These characters actually talk like real people in short bursts. King does not fall into the trap of making his characters double as narrators explaining the events surrounding them. They subscribe to the philosophy that, if given enough space to work, Gerads can draw everything we need to know. I rarely buy single issues because, frankly, they don’t feel worth the cover price. Often times they strike me as far too brief, disjointed, and obviously part of a much larger whole. Mister Miracle #1 is obviously part of a larger story, yet due to the sheer amount of artwork, events, and story within, it proved totally satisfying. Like I said, I consider it the best first issue I’ve read in a quite a while, maybe ever! Well done to all involved! On a final note, and this is perhaps the greatest compliment I can offer, I will definitely be in my local comic shop for issue #2. If such quality continues, I plan to buy all twelve issues of this series. As someone who has primarily bought only collected editions during the past fifteen years, I can bestow no greater honor. This issue is so gloriously weird and so masterfully executed that you have to experience it. It’s seriously a must-read book for any comic lover out there. As part of the Young Animal imprint (which is a division of DC Comics and, apparently, somehow connected to the mainstream content), Bug! The Adventures Of Forager utilizes several of Jack Kirby’s DC contributions, most notably Bug and Sandman. The first installment of this series is so strange. Bug wakes up after apparently breaking out of a cocoon. He’s in a basement. He’s flashing back to Cosmic Odyssey – you may need to “Google” that one. A ghost girl appears along with a talking teddy bear. This may be my favorite paragraph ever. I won’t spoil it further, but if you loved Jack Kirby’s trippy Fourth World, this book is just as nuts if not more so! That’s not to say it isn’t well-constructed, though. Lee and Michael Allred definitely seem to be headed somewhere. There is a great deal of foreshadowing, and there are also several references to the past — we’re talking before Rebirth, before The New 52, even before Zero Hour — that raise very interesting questions not just about this title in particular but about the Young Animal imprint as a whole. So along with a wild story and appearances by several revered Fourth World characters, you also have the most beautiful sequential art you will ever see. Michael Allred is a very special talent. Every single panel in this book is magnificent. Not only is he a master of anatomy, but Allred is also able to do something many artists are not — he is able to convey body language and facial expressions that progress the story. There are no superhero poses in this book. His characters put actual weight on a single leg while standing, their fingers are never clenched into a superhero fist, and their faces convey actual emotion. It is wonderful to behold. Let’s not forget Laura Allred’s colors. Michael Allred’s pencils and inks are gorgeous, but Laura’s colors amplify them exponentially. It’s hard to pull of pink, red, and bright yellow in a single panel, but Laura does it and makes it all look perfectly complimentary. Amazing. Does this issue make any sense at all as a standalone? Not really, no. But, it absolutely lays solid groundwork for what seems to be a focused direction, and the wonderful art, Kirby character appearances, oddness, and general sense of fun make it a must-read issue. Enjoy! Let me begin by stating that while I am a self-admitted comic book fan, I am by no means a die-hard Fantastic Four fan. I’ve always thought they were a neat team, but I’ve never really been interested in them or their comic. Okay, with that out of the way, I think we all understand that I am by no means as critical when it comes to the Fantastic Four as I would be with, say, Batman or the Flash. My wife and I went to see the Fantastic Four movie while on vacation from our summer vacation. I had no expectations whatsoever and I was pleasantly surprised by what I saw. Here we had a film that was exactly what it should have been, a lighthearted movie about a family-like team of superheroes who banter and quibble as most families do. It was a great deal of fun to see their powers showcased, and the film was nowhere near as campy or cheesy as I thought it would be from what I saw in the previews. Was this the dark psychodrama of Batman? No. Was this the film noir of Sin City? Not in the least. What it was, however, was a movie that was plain and simply put fun to watch. Sorry if I’m upsetting all the Kirby and Lee fans out there who judge me to be committing Fantastic Four sacrilege, but I liked the movie. Go check it out if you want to have some good old fashioned summer movie fun!